App Review: CleverMedia’s Free Style | When Will Apple? 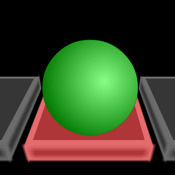 Basically it’s a puzzle game where you move your game piece over red tiles and turn them green. You do this for each row while avoiding the X (landing on X ends the game) which moves around on the row randomly. Once you have no red tiles left you navigate your way to the passage to the next row. The puzzle itself isn’t all that challenging…it’s more of just moving back and forth and making sure not to move to a spot if there is an X on it. I think the game would draw me in more if the puzzle was less random and more pattern based to make more educated moves…maybe there is, but I don’t see it. If you are looking for a quick game to kill some time it fits the bill, but it’s not as engaging as some other puzzle games. I couldn’t see myself sitting down and playing this for hours on end, but as this game is rated 4+ and has the fun music aspect I do think a younger audience may enjoy playing it more than I did. Thanks to CleverMedia, Inc. for providing us with the app for review.